The Handwriting and Keyboarding survey has ended with over 200 responses. 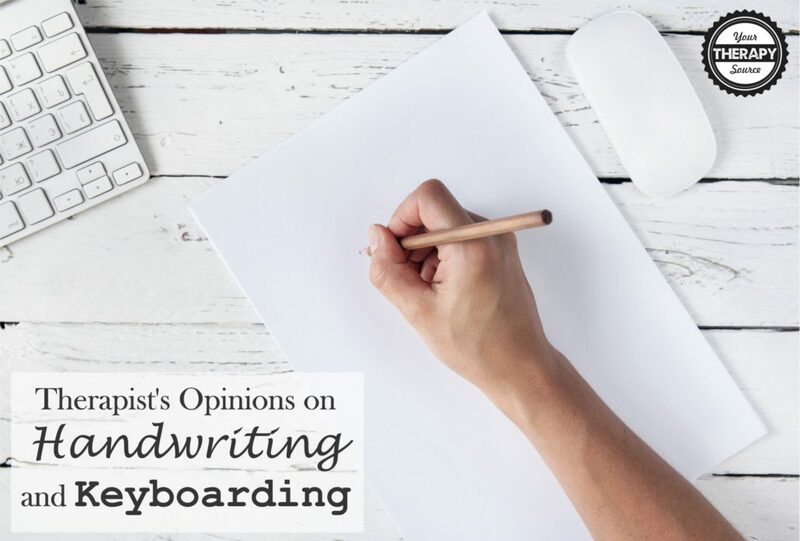 The purpose of this survey was to get the opinions of pediatric therapists, parents and teachers on handwriting versus keyboarding. Here are the overall responses with comments at the bottom. Please don’t forget to answer the current survey when you are done reading this post. Question 1: Are you an OT, COTA, PT, PTA, Speech Therapist, Teacher, Parent or Other? Question 4: Based on your experience, in what grade does the emphasis switch from handwriting to keyboarding for written production? Question 5: Based on your experience, in what grade should technology be primarily utilized for students with significant handwriting deficits? I put 4th grade for the last question but it really depends on the kid, teachers, parents, etc. as to when I start keyboarding with my students. Currently in our society,keyboarding/screen time and alternatives to handwriting and manipulation are too accessible too early in childhood development. This results in poor habits with both handwriting and keyboarding. With all techniques and applications, we NEED to professionally evaluate the cost/outcome of all screen tools on the long term skills and habits rather than push for the quick fixes. Use of technology for students with handwriting difficulties is on a student by student basis depending on what skills they have/do not have. It can start as early as needed if the child requires that as their method of expression. Keyboarding/typing should be introduced in elementary school for all students. At that time, they are finished with the handwriting and cursive curriculum. This will give kids the opportunity to use the keyboard more efficiently instead of creating less efficient motor memory habits by the time they hit middle school keyboarding. Theses answers are also based on the organization and curriculum used in the particular district I work in. If, by 3rd grade, students are still not functional with handwriting, I begin working on computer skills with them. If computer use proves to be a stronger skill for them, then we being integrating it into their day around 4th grade. Then they can grow their independence in 5th grade and be ready for middle school. Depends on skills and diagnosis. If severe motor impairment, technology can begin as early as preschool. However students don’t like to look different from their peers, so it can be difficult to incorporate technology in the classroom setting and have the student on-board with using it. Each child is different in that their developmental level may not be that of their age and therefore they are not ready for keyboarding. Studies have shown the benefits of handwriting on reading as well as memory and although this is the “age of technology” it is still important for a student to be able to write. This should be decided on a case by case basis. I am not even sure why this is a survey for therapist. Too much emphasis is put on OT’s being involved in handwriting and OT is so much more than a handwriting teacher. I rarely pick up a child on caseload for illegible handwriting. My decisions on the above questions aren’t so much dependent upon the student’s grade but more depend on the individual student’s fine motor skills, visual motor abilities, and their cognition; what are the classroom expectations for the student; and what written communication needs can’t they achieve without assistive technology. Handwriting is much more than pencil to paper. Handwriting needs to be taught K-Gr 2, with review and revision to help students gain the proper foundation. K-G2 is learning to write, after that is writing to learn. If students are not given the proper foundation, it is difficult to tell if they are going to be more successful on keyboarding. It depends on the child’s problem. I have a child with severe arthrogryposis in first grade who I am advocating for the use of a keyboard. Not sure what the question on when the emphasis switches from handwriting to keyboarding. In my former district the kids got to chose once they got into middle school. I am not sure when the gen ed kids “have ” to type. Once a student has learned how to print, then technology should be started whenever that student is unable to show what they know because of significant handwriting deficits. Handwriting can continue but when that student is no longer able to show what they know through their writing. First questions based on a ‘normal’ child. Last question based on dyslexia/dyspraxia. Some, not many, children would need assistive technology from the start. I think that children benefit from handwriting and keyboarding instruction at the same time. If at all possible, they should be fluent in both! In my district, despite availability of laptops, desktops, and iPads in a less than 1 device per 1 student ratio (perhaps 1 device per 3 or 4 students overall), the emphasis does NOT switch from handwriting to keyboarding at any grade, including high school. Even students who qualify for special education, have received OT, and for whom I have recommended and at a minimum introduced keyboarding for are continually expected to write. Generally, parents and teachers alike persist with wanting OT to ‘fix’ or at least address handwriting. Despite collaboration and education, this is a huge roadblock I hit that appears to be only a block in the mindset of others. Please don’t forget to answer the current survey!